These are the websites for the EMRP Joint Research Project Metrology for a universal ear simulator and the perception of non-audible sound (EMRP Call 2011 Health HLT01), briefly called the Ears Project. The websites give an introduction to the project. If we raised your interest please do not hesitate to contact us for further details. You can also sign up our regular newsletter for us keeping you up-to-date with our recent results. Please contact the project coordinator for all concerns of the project. 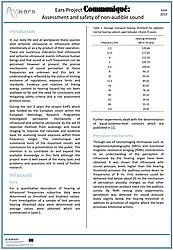 Project communiqué "assessment and safety of non-audible sound"
During the last 3 years the project EARS investigated perception mechanisms of infrasound and airborne ultrasound by the aid of objective methods from audiology and neural imaging to improve the rationale and evidence base for assessing sound exposure within these frequency ranges. This communiqué will summarize most of the important results and conclusions for a presentation to the public. The intention is to contribute to and expand the available knowledge in this field although the project team is well aware of the many tasks and problems and questions still in need of further research. There are numerous indicators that infrasound and airborne ultrasound emission influences human beings and that sound at such frequencies can be perceived. However at present, the precise mechanisms of sound perception at these frequencies are unknown and this lack in understanding is reflected by the disappointing status of existing regulations, standards and safety. 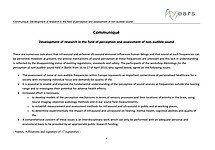 The participants of the workshop Metrology for the perception of non-audible sound held in Berlin from 16 to 17 of April 2015 signed this communiqué. The Institute of Sound and Vibration Research at Southampton University and the National Physical Laboratory have established a UK working group to set out the current concerns and focus attention on the Health Effects of Ultrasound in Air (HEFUA). The first meeting was held at NPL on 3rd March, chaired by Prof. Tim Leighton of ISVR, and a preliminary HEFUA website is also now online. This working group has been set up in response to growing concern over the health impacts of the numerous new sources appearing in general urban environment, and follows work conducted in parallel with the EARS project to establish new measurement standards for airborne ultrasound, and investigate human neural responses to such sounds. From 16th to 17th of April participants from 6 different countries met to discuss the results of the project EARS and to show own contributions in talks and on posters. Three invited talks and two round table discussions gave an ample possibility for scientific exchange among the 33 participants. The final meeting of the EARS project was held on April 21/22 2015 in Istanbul. Twelve participants met for two days to report the final results, to close the project and to discuss future challenges. The development of a universal ear simulator and its application in hearing screening and assessment. 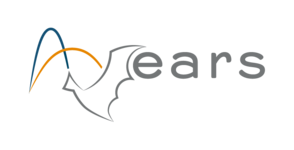 The cornerstone of the dissemination activities in the EARS project are two workshops covering distinct aspects of the project scope, on the development of the universal ear simulator, and on the perception of non-audible sound. The first of these took place at the National Physical Laboratory on 26th March 2015 and covered the development of the universal ear simulator. The workshop had 28 attendees from clinical audiology, medical physics, national health services, audiological equipment manufacturers, calibration laboratories and NMIs outside of the consortium. Attendees came from UK, Denmark, Germany and Switzerland. 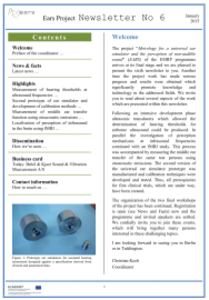 The EARS project arrives at its final stage and we are pleased to present the sixth newsletter to you. Another time the project work has made serious progress and results were obtained which significantly promote knowledge and technology in the addressed fields. We invite you to read about several aspects of the work which are presented within this newsletter. Following an intensive development phase ultrasonic transducers which allowed the determination of hearing thresholds for airborne ultrasound could be produced. In parallel the investigation of perception mechanisms at infrasound frequencies continued with an fMRI study. This process was accompanied by measuring the middle ear transfer of the same test persons using otoacoustic emissions. The second version of the universal ear simulator prototype was manufactured and calibration techniques were developed and tested. Thus, all prerequisites for first clinical trials, which are under way, have been created.